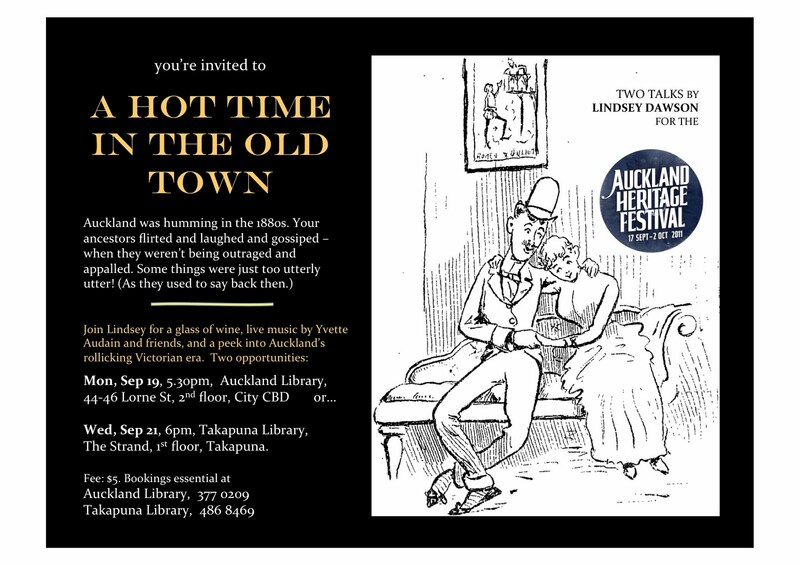 ONE WEEK TO GO before my Auckland talks on what a humming town this was in the 1880s. Your ancestors flirted and laughed and gossiped when they weren’t being outraged and appalled. Some things were just too “utterly utter”, as they used to say back then. You can hear more about this from me during the upcoming Auckland Heritage Festival. We often have the wrong idea about our ancestors. We look at their stiff old portraits and think they look so grim, but there was plenty going on in Auckland’s early days. In the 1880s the town was barely 40 years old and brimming with ambition, big dreams and large egos. And Aucklanders were already looking for weekend getaway places like the big hotel at Waiwera, which an editor of the era called “awfully jolly”. I love how the past is just a mirror of today. We’ve got satellite feeds and social media now, but back then people adored their newspapers. Murders, robberies and romance – it was all in the weekly rag. And Auckland had a beauty – an acerbic little journal called the Observer. I’ve unearthed lots of old Auckland secrets from its pages – and the sweet illustration you see here is also from there. * I’m speaking at Auckland City Library, 5.30pm Sept 19, and at Takapuna Library, 6pm Sep 21. Tickets $5. That includes a welcoming glass of wine and lovely live opening music from clarinetist Yvette Audain and two talented friends. To book: Ph 307 7764 for the Auckland event or 486 8469 for Takapuna. .
* The Auckland Heritage Festival runs from Sep 17 to Oct 2 and offers more than 200 events all over Auckland. San Diego: 4 Panels, 4 Days - Come join us for any or all of this year’s panels.